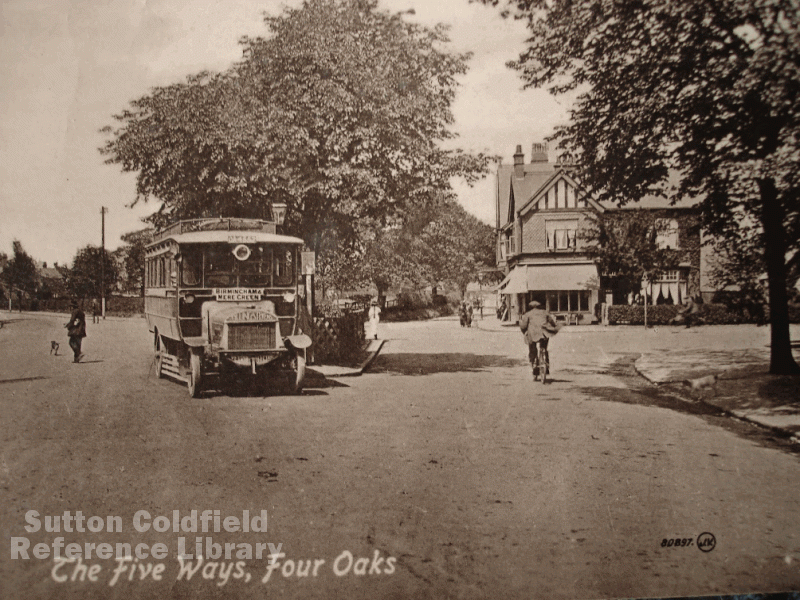 The first bus services in Sutton were provided by horse-drawn omnibuses, as Miss Bracken, writing in 1860, noted, ““Other modes of breaking the silence have been discovered in omnibuses oscillating between Birmingham and Sutton, with multitudes imported for a few hours respiration of Coldfield air.” The opening of the Sutton Coldfield branch railway in 1862 replaced the bus services to some extent, but by the end of the century increased population, new housing developments, and the improved state of the roads made the cheap horse-drawn omnibuses a popular alternative to rail travel. At first were many small bus operators, but by 1890 several had combined to form a company which later became the Birmingham and Midland Motor Omnibus Company (‘Midland Red’). This company had over seventy omnibuses and five hundred horses. When new horse omnibuses were ordered in 1900 they were painted red. The Birmingham and Midland Motor Omnibus Company (BMMO) was formed in 1904, but relied almost entirely on the red-painted horse buses, the handful of unreliable motor vehicles it inherited were soon disposed of. Then in 1912 the BMMO ordered a fleet of motor buses and began to expand its services. Deliveries of the new Tilling-Stevens vehicles began in 1914, and were soon a familiar sight in Sutton, mainly along the two routes Birmingham to Mere Green via Erdington and Birmingham to Four Oaks via Boldmere. The single-deck buses could seat 27 passengers, but the solid tyres made for a rough ride, the lack of gears meant it was often noisy, and the limited power of the two brakes on the rear wheels must have caused some scary moments. Services expanded after the end of the Great War, and a Midland Red route map dating from 1920 indicates route numbers 18, 18a, 18b and 18c between Birmingham and Sutton, Birmingham and Streetly, Birmingham-Sutton-Tamworth-Ashby, and Birmingham-Sutton-Lichfield-Burton. This was no doubt indicative of the rate of route expansion by the company at this stage. Route numbers were drastically altered from 1921 to comply with Birmingham City Transport requirements; double digit route numbers were reserved for BCT services while the Midland “Red” route numbers contained three digits such as 107, 109, 110, 113, S76, S67 for routes within the Borough. The Tilling-Stevens buses were obsolescent by 1923, and from that date until 1970 most of the Midland Red buses were designed and built by the BMMO. Sutton Borough Council had disagreements with the Midland Red which delayed the opening of their garage on Upper Holland Road until 1934, and restricted services in the borough to single-decker buses until 1938. From the 1930s onwards the fleets of buses struggled to cope with the crowds of rush-hour passengers, and long queues at the bus stops, particularly in Jockey Road, were a common sight. (This History Spot is based on research by Roy Billingham). A “Midland Red” Tilling-Stevens TS3 bus waits at Mere Green Island c.1920.